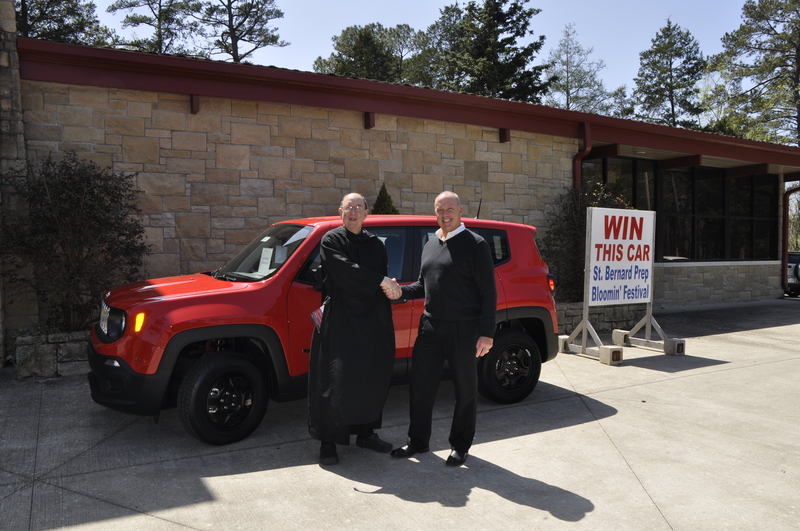 Father Joel Martin, president of Saint Bernard Prep School, takes the keys to the 2018 Jeep Renegade from Scott Spitzer, general manager of Cullman Chrysler Dodge to be awarded to the grand prize winner at the 34th Annual Bloomin’ Festival Arts and Crafts Fair in Cullman on April 21-22, 2018. CULLMAN – Excitement is building at Saint Bernard in Cullman, as everyone on campus prepares to showcase the 34th Annual Bloomin’ Festival Arts and Crafts Fair scheduled for the weekend of April 21-22. More than 170 artisans will cover the grounds to sell their handmade works. Saint Bernard Prep and Ave Maria Grotto will combine forces to host one of the South’s favorite arts and crafts fairs. Artisans from across the Southeastern United States will bring their creations. Pottery, jewelry, birdhouses, artwork, yard art, furniture, clothing, toys, blown glass, painted signs, handbags, hair bows, woodcarvings and freshly-made fudge are just some of the items to be found at this year’s festival. Visitors can also enjoy watching kettle corn being popped in a huge outdoor pot, or stroll across the yard to observe local blacksmith, Allen Kress, forge plant hangers, towel racks and other items. Just feet away from the Grotto, a mill will be grinding fresh cornmeal and grits, which are so popular on southern tables. Along with the booths of the artisans, there will be large tents serving delicious concessions to include: fresh smoked chicken, polish sausages, hamburgers and all the fixings, and ice-cold Pepsi or fresh-squeezed lemonade. Deep-fried funnel cakes have been a specialty for decades, as are the hot strawberry waffles and fresh caramel-apple chips. Another signature item at the Bloomin’ Festival is the homemade Monk’s bread baked by Brother Benedict Dyar. In addition to Monk’s Bread, the monks will be selling their Benedictine Brew coffee. Festival T-shirts will be available on the grounds for $20, each as well as Saint Bernard hoodies, caps and a limited number of sweatshirts. Live entertainment provided by Saint Bernard students will be provided throughout the weekend with a special performance of blue grass music by the Cotton Pick’n Kids on Sunday afternoon at 2 p.m.
Sunday afternoon, at 5 p.m., Father Joel Martin, president of Saint Bernard Prep, will draw a lucky name from a barrel to choose the winner of a 2018 Jeep Renegade and other valuable prizes. Sponsorships are very important to the Bloomin’ Festival as they help with promotional expenses. The school is thankful to have such wonderful support from the following businesses and encourages the community to support them as well: Cullman Chrysler Dodge, O.F. Richter and Sons, Leaffilter, Pepsi, Billy Ray Taylor Auto Sales, Hendon and Huckestein Architects, Jet Pep, Merchants Bank, Wal-Mart Distribution, Cullman Jefferson Gas, Cook’s Pest Control and Regions Bank. Festival hours are 9 a.m. to 5 p.m. both days, Saturday and Sunday.